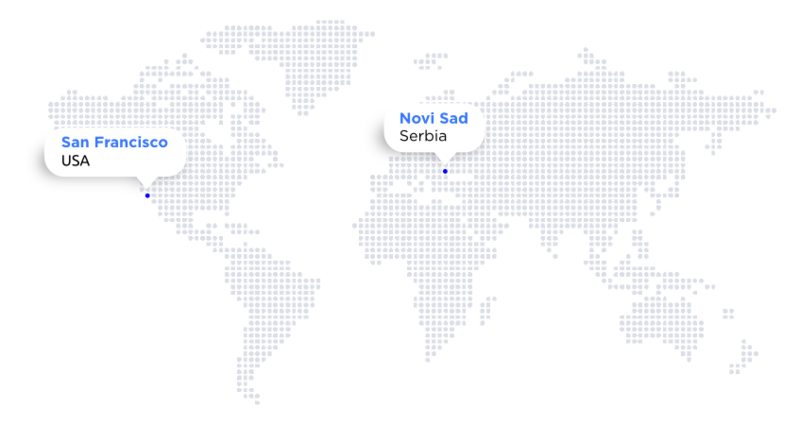 BDIT Engineering is a software engineering company with headquarters in Novi Sad and an office in San Francisco. BDIT has earned the trust of San Francisco companies by delivering innovative solutions over the past 10 years. Transform your business with high-value applications developed by our experts and built just for you. We will be happy to assist you at any and every stage of the software development life cycle. We support customers’ IT initiatives by providing help with software development, implementation, administration and software support, as well as strategic, architectural and operational planning. Refine high-level business processes that involve different departments, applications and data sources without applying excessive application or data structure changes. We have extensive experience in organizing and curating big data, while transforming it into valuable and actionable insights that create tangible outcomes. We provide customer care, technical support, sales and marketing activities by using appropriate channels of communication to enable interactions that create value for the customer and company. We provide maintenance and support services that enable your entire system to run smoothly and reliably, while your team stays focused on business opportunities and challenges. BDIT Engineering is a software development company with a great passion for creating high quality software. We love challenges and most importantly, we love helping our clients to streamline their business by delivering innovative solutions. We are a team of experienced and devoted software engineers, data engineers and IT consultants. What drives us to continuously improve is accomplishing our customer’s objectives. We provide a full spectrum of software engineering services to companies in various industries and we’re always looking forward to new opportunities. Proven software engineering principles underlie all our design and development practices. We integrate the customer in every step of the way to ensure a product that truly satisfies the requirements. After a decade of working together very closely, we have became partners with Kunal Sarkar – one of the founders of Lumosity. Our shared goal is to continue delivering innovative software solutions and to provide extraordinary service and proactive support to our clients. Our team helped Lumosity to create a great android experience which landed its application on the “Google Play Store – Best Apps of 2014” list. The aim of this project was to create a library for sending different data to different endpoints without losing packages and to improve persistence layer, resulting in better overall architecture and responsiveness of the application. By closely working with the data engineering team, and leading the initiative to introduce dependency injection, we brought the testability of the application to the next level. The combined efforts of Shyp data engineers and our team lead to the creation of Shyp Data Warehouse by utilizing the power of SQL and Looker reports. Different metrics inside Shyp were covered to provide key information and help management and finance sector get real value from their data. We couldn’t be more happy with the support we received from BDIT Engineering. They are our go to place when we need engineering expertise. BDIT Engineering came highly recommended from a trusted advisor and it was immediately clear why. The level of service and support was more like a partnership or collaboration than the usual vendor relationship, and the increased flexibility helped us manage our workload and team growth effectively at a crucial period in the life of our startup. I’m glad we chose BDIT and I’m happy to recommend them to anyone looking for thorough, reliable software engineering services. I have worked with dozens of outside development agencies in my career, domestic and offshore, and BDIT Engineering has consistently been the best experience. Tellingly, I've continued to engage with BDIT even when I shift employers myself, because I know exactly the quality BDIT delivers. They have reliably maintained this quality even across multiple engineers and technologies (React/Redux, iOS, Java Server, Data Engineering, NodeJS). Our team has benefited tremendously from working with BDIT Engineering. BDIT has automated and improved several parts of our workflow (e.g., API integrations with AdWords and Facebook, data ingestion tools for offline marketing partners, dashboards and other reporting tools). As a result, we can work with several vendors, deploy tests, and manage performance -- ourselves and without agencies -- utilizing only a very lean team. From helping our team navigate an overhaul to our mobile billing system to delivering world class analytic tools that help drive our daily decision making as a product team, the BDIT Engineering team has been an invaluable partner in growing our business. As a Product Manager, I especially appreciate BDIT’s ability to integrate smoothly with our existing engineering process and team; providing scale, without adding overhead.